We now offer FREE SHIPPING for all of our customers! Item currency is USD. We ship either by small parcel, CP Parcel (regular airmail) or Express Mail Service (EMS). The available shipping methods are informed to each customer during checkout. You are free to choose to have your order dispatched by free shipping, free shipping with a tracking no, or by faster EMS delivery! We usually ship within 3 business days of receiving payment if all items ordered are readily available. We stock heavily on our inventory, but also work with manufacturers and suppliers who ship to us every day. HOWEVER, due to the fact that all of our items are official items of limited editions and quantity, sometimes the merchandise might still run out at the time when we receive your orders. At a time like this, we will either refund your payment directly or send you a notification letter for the earliest expected delivery date. We will start packing your items ONLY AFTER we receive your order and payment. Any order that is not completed with payment will NOT be reserved. If you are concerned with the availability of items and the earliest available day, it's better that you check with us before you order. Please note that any local duties, customs, and taxes that apply must be paid by you, the recipient, upon delivery. We try our best to avoid shipping delays and incurring such charges, but we cannot be held responsible for foreign customs delays or imposed duties. Being a online store based outside of your country, we find the shipping delivery lead-time is something very challenging. We always try to shorten the delivery lead-time for our valuable customers by all means possible; we promise this is still an on-going efforts from us! Many customers found our items are very much worthy of the wait as our items are often rare and no way to be purchased in your local store & country! Or if you plan to buy our items as gifts or for use in special occasions, it's always the best that you plan earlier and contact us firstfor checking the availability & making special shipping arrangments. We're sure with a little bit planning in advance and acknowledgment, you will have a very satisfying shopping experience at our store! If your parcel is unclaimed and returned to us, we will notify you by email. Such a situation may occur if you are unavailable or the address you provided was insufficient. 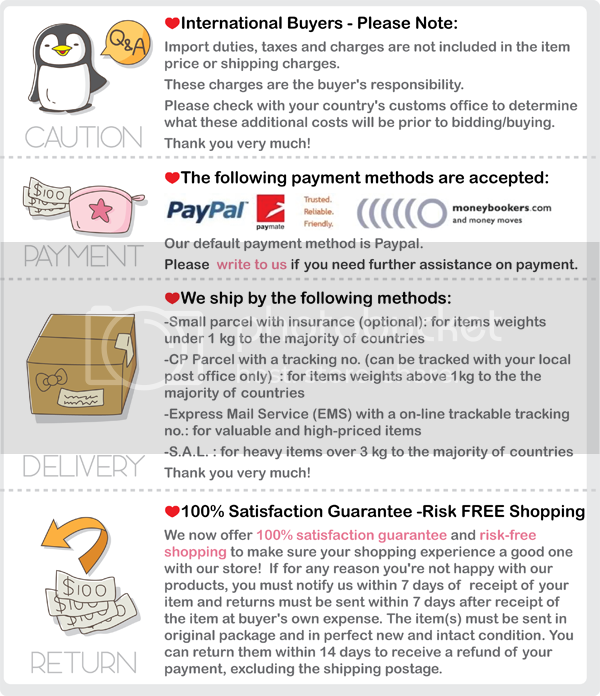 We will resend your items for you ONLY if you pay for the postage of second trip. If you prefer a refund, the refund will be the purchase price less shipping charges and a 15% re-stocking fee. A Cute Shop is committed to protecting your privacy. We will not sell or disclose any information that identifies you to a third party without your prior approval. We may use the information we collect to periodically notify you about new services or special offers we think you'll find valuable. If you would rather not receive this information, you may send an e-mail to acuteshop@gmail.com with "unsubscribe" as the subject line. A Cute Shop does not sell, trade or rent your personal information to others. Restrictions on the Use of the Materials in Our Web Site: The A Cute Shop website and all of its content are copyrighted materials, protected by international copyright laws. The compilation of content on our website is the exclusive property of A Cute Shop and the brands we carry and may not be used for any purpose other than browsing, shopping, and using the information provided for your own private use and entertainment. Additionally, A Cute Shop name and logos are trademarks of Cute Life International. Site material, including pictures, product descriptions, site features, and artist biographies, may be downloaded onto one computer or printed out for personal, non-commercial use only, provided copyright, trademark, or other proprietary notices are not changed or deleted and, in the case of printing, that reproduction is not done in large quantities (defined as ten or more copies of a particular image, description, or biography). Any modification of the materials on our website or use of them for any other purpose will violate our intellectual property rights. Everything you download images and data--remains our property. We retain full and complete title to the software and to all associated intellectual property rights. We accept returns Returns must be sent within 7 days after receipt of the item at buyer's own expense. Item must be in new condition and in all original packaging. We issue refund for item's price only. In the event you receive a non-functioning product, @ Cute Shop will provide a full refund plus the return shipping cost provided you contact us within 14 days of receipt of the product (verified by tracking information). The refund will be made to the buyer’s PayPal account once we receive the return product. The 14-day DOA guarantee is offered for electronic items only. We sell only new, never-used products in original packaging. Please refer to each item description for specific warranty information. If your products fails after 14 days of receipt up to the end of your warranty period, please email us your sales record and payment details to make a paid return request. We will act as your agent to send the product in for repair; however, you are responsible for shipping costs both ways. If the product were damaged through human error, the warranty will be voided. You can place an order with or without an account but you could receive more benefits when you sign up an account with us! . If you have any questions about your ordering please contact us at acuteshop@gmail.com or leave us a message at our forum. All major credit cards accepted and encrypted by SSL 128 bits through Google Wallet. Please write in for an invoice if you need to pay by credit cards directly. If you need to send us money by bank wire transfer & Western Union instant money transfer, please contact us at acuteshop@gmail.com for further information. We now offer 100% satisfaction guarantee and risk-free shopping to make sure your shopping experience a good one with our store! If for any reason you're not happy with our products, you must notify us within 7 days of receipt of your item and returns must be sent within 7 days after receipt of the item at buyer's own expense. The item(s) must be sent in original package and in perfect new and intact condition. You can return them within 14 days to receive a refund of your payment, excluding the shipping postage. Import duties, taxes and charges are not included in the item price or shhipping charges.These charges are the buyer's responsibility. Please check with your country's customs office to determine what these additional costs will be prior to bidding/buying. hank you very much. Once your package ships we will send an email with a link to track your order. You can check the status of your order by logging into your account. If you have any questions about your order please contact us at acuteshop@gmail.com or leave us a message at our forum. Any time you wish to update your account information, you can do so by logging into your account. If you have any questions about your account please contact us at acuteshop@gmail.com or leave us a message at our forum.